In 2014, when Emma Nelson was born, NICU staff told her parents, Kim and Justin, to prepare for the worst. But for the next two years, Emma had no diagnosis. Kim and Justin were directed from one specialist to the next trying to find answers to their daughter’s unique symptoms. 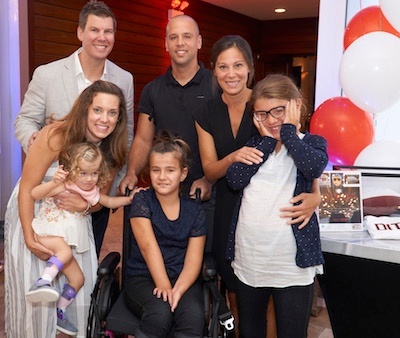 In the fall of 2016, Emma underwent whole-exome sequencing, which revealed a single mutation in the MAGEL2 gene, a mutation that was too small to be detected on less-refined tests. Finally, the Nelsons had the diagnosis they had been searching for. Their daughter had an ultra-rare genetic disorder: Schaaf-Yang Syndrome (SYS). Emma was only the 28th patient to be diagnosed. Over the past several years FPWR has became involved in SYS research because the MAGEL2 gene, which is implicated in SYS, is also missing in PWS. That provides an opportunity for research to benefit both rare syndromes. To date, FPWR has funded a number of studies to understand how MAGEL2 normally functions and how the loss of MAGEL2 function causes the symptoms associated with SYS and PWS. Within a week of receiving Emma's diagnosis, Kim Nelson called FPWR, and I spoke with her. She asked how she could help move Schaaf-Yang research forward. She was passionate and determined to help Emma. She wasn’t going to let this diagnosis define their daughter. For eight years, Kim and her family had been hosting the annual "I Gotta Guy Sausage Festival" in Chicago, donating the proceeds to the Cystic Fibrosis Foundation. After they received Emma's diagnosis, they shifted the focus of the event to fundraise for the best Schaaf-Yang research in the world. Last month, they hosted the ninth annual event in downtown Chicago. More than 450 guests came to the event, raising $170,000. 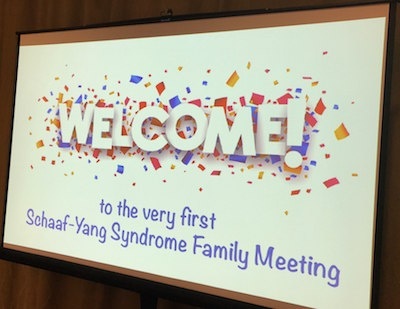 With Kim’s involvement, FPWR was able to host the first conference for SYS families this fall. FPWR’s 2017 family conference, with the theme "Dream, Believe, Achieve," welcomed seven Schaaf-Yang families and their children from across the U.S. and Canada. Drs. Schaaf, Potts, and Wevrick gave informative presentations about SYS (you can watch them here). Families and researchers also participated in an important sharing session that will be used to prioritize further SYS research as we work to address the most pressing challenges of the disease. Kim and Justin aren’t going to stop their efforts to spread SYS awareness and raise funds for SYS research any time soon. With their Sausage Festival less than a month behind them, they are already preparing for next year’s event — scheduled for August 23, 2018 — and brainstorming about how they can make the event even better.